It’s time to share samples using Kraftin Kimmie Stamps‘ new Moonlight Whispers images! This month Annie has created a set of six Candy Girls. How fun! You can find a list of direct links to more samples HERE on the Krafty Blog. Be sure to leave comments as you look! Kimmie will be giving away two sets of three images, just for commenting. It’s also a challenge day. 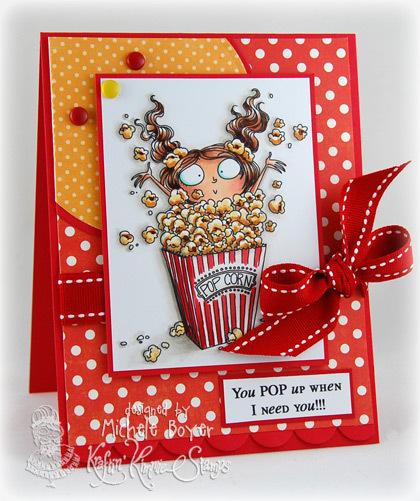 Head on over to the Krafty Blog, check out this month’s sketch and create a card using any KKS image. Upload your creation there on the Krafty Blog and you could win a free Moonlight Whispers image from this release! I colored with Copics, popped up the image panel and used three brads as my “embellishments” in upper left the corner. 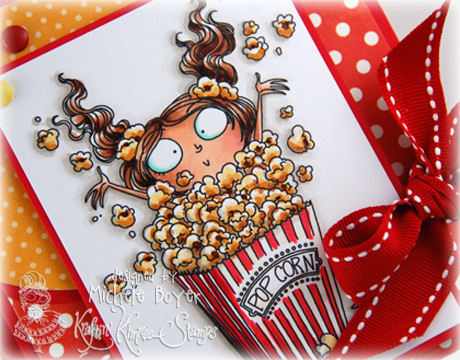 Stamps: Kraftin Kimmie Stamps “Pippa Popcorn” (Moonlight Whispers) Ink: Memento Tuxedo Black Paper: My Favorite Things Red Hot cardstock, X-Press It Blending Card, Echo Park Dots & Stripes “Homefront” (6×6) Accessories: Copic markers (E00, E11, BV000, R20, E13, E15, E18, Y21, YR23, YR27, E50, R24, R29, BG11, W00, W1, W3), Michaels brads, Papertrey Ink ribbon, My Favorite Things Simply Scallops Border Die-namics, foam boosters. Finished size 4 1/4″ x 5 1/2″. 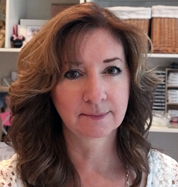 This entry was posted in Kraftin Kimmie, My Designs. Bookmark the permalink. wow…I love this image…and also all the polka dots you used…you Krafty girls are sooooo talented…I continue to be inspired by every one of your creations…thanks for sharing. wow! love the image, love the papers you used, just makes me smile! F-U-N! Love the yellow and red and that saddle stitch ribbon is the perfect touch! This is fabulous! I really like the colour scheme and layout and yes… that image is cute, cute, cute! Oh my, this is a fabulous image!!! Love your card Michele!! OMG do I love her, what a fab image and your card is fantastic! I am in love with this card! I think it is one of he prettiest cards I have seen! I love polka dots, the stitching on the ribbon is perfect with them and the color combination is wonderful! I have put this in my inspiration file! Wishing you a sunshine weekend! this is so adorable, love the colors and the great card design you used with this sketch, the image is so cute. This is sooo fabulous. Great coloring of that image and I love your take on the sketch. Great color combo too. It’s really striking! Wow, this is wonderful, lovely Details and colors. Such a great card! I always love your colour combinations and colouring! Absolutely adorable, and that popcorn looks yummy! This card is too cute…I love the colors and papers! Love it! Super cute and that ribbon is gorgeous! Oh what FUN!! I love how lively your card is! When I realized that you “popped” it up that’s absolutely brilliant! Thanks so much for sharing! So well put together and your mad coloring skillz highlight the movement of the scene! Lovely! I do *love* this card! SO SWEET!